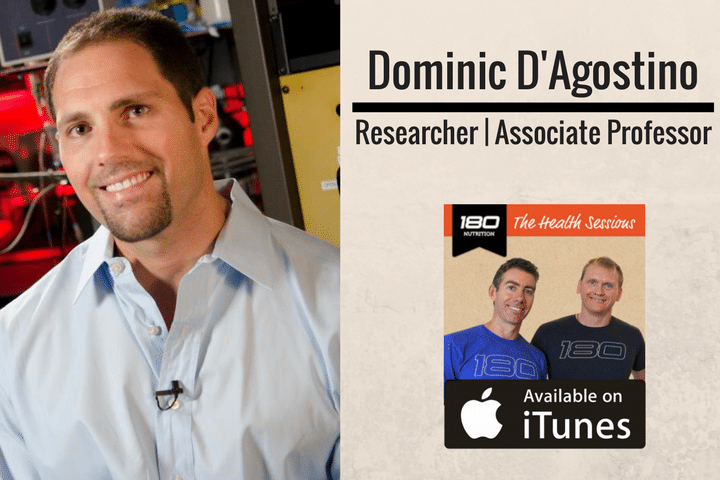 Guy: This week we welcome to the show author, speaker, comedian and internet Youtube sensation Dominic D’Agostino. He is researcher and teacher with a rich degree of experience in the fields of neuroscience, molecular pharmacology, and physiology, Dominic D’Agostino, Ph.D., serves as an Assistant Professor at the University of South Florida (USF). Commanding an impressive professional and academic background, D’Agostino laid the foundations for his career while an undergraduate at Rutgers University, during which time he received his school’s Educational Advancement Scholarship. Hey, this is Guy Lawrence from 180 Nutrition, and of course, welcome to another fantastic episode of The Health Sessions, where we are constantly connecting with leading global health and wellness experts to show the best and the latest science and thinking, empowering us all to turn our health and lives around. Yeah, for sure. We’re going to be pretty interested in the topic of ketosis today which we’d love to delve into a little bit, because I think it’s such a fascinating topic. There’s a lot of confusion around it, there’s a lot of opinions and so forth, especially in the nutritional world. I’m sure you’ve come across a few. But before we get stuck into it, do you mind taking a little of background with your own journey, sort of what led you into even the interest of nutrition in the first place and … for our listeners who have probably not been exposed to your work before? Sure. Well, I guess going back to high school, I was always very interested in performance enhancement and fitness and training. I majored in nutrition as an undergrad, nutrition science, and kind of quickly realized there wasn’t a whole lot of jobs in that area, so I double majored in biology too and went the pre-med track until I started doing undergraduate research more or less to try to get into med school, so it’d look good on application. I got stuck into basic science research, which was studying the brain stem mechanisms of respiratory and cardiovascular control, so autonomic regulation. How our brain controls our physiology, with a big interest in oxy environments or extreme environments too, and what goes wrong when the brain is not sensing oxygen levels appropriately. That research got me into studying … being interested in, I should say, diet and physiology. Then I did my post-doctoral fellowship studying the effects of high levels of oxygen. I was able to … and that was a neuroscience post-doctoral fellowship. I was able to bring back nutrition into my neuroscience program because the ketogenic diet works to prevent seizures, and one consequence of being exposed to higher pressure oxygen is a tonic-clonic seizure. My research was to develop technologies to understand that, and also to develop things that could prevent oxygen toxicity seizures, to enhance the safety and performance of divers underwater. Yeah, got it. So that led you first interested into ketosis, I’m guessing? That piqued your interest, yeah. When did you first hear of ketosis? When did it come on the radar for you? Well, I’ve known about it probably since the early to mid-1990s, and mostly in the fitness circles where … well I’ve heard about the Atkin’s diet of course, and then people are calling a very low carb, high protein diet a ketogenic diet. But I later found out that a low carb diet is most likely not a ketogenic, that it really has to be high fat, and moderate to low protein. The clinical ketogenic diet was 10% protein, really, and now modified versions are like 20% protein. I basically started studying the classical ketogenic diet as a metabolic therapy for drug-resistant epilepsy, because I wanted to explore other anti-seizure strategies that could be used in a [inaudible 00:07:32] that wouldn’t necessarily impair cognitive or physical performance like anti-epileptic drugs do. At the time, there was very little information really on performance in the ketogenic diet, like 10 years ago, and Jeff Volek was just starting to do some research around that time. 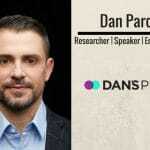 Then I reached out the people that were actually doing ketogenic diet research clinically and using it in their patients, which is that the folks at Johns Hopkins University, Barrow Neurological Institute, connected with some of the pioneers in this field, and quickly realized that this could be a path that I could direct my research into. Ketones were essentially making the brain run more eficiently and that’s why it was preventing a seizure from ocuring and in an environment that was causing oxidated stress and neuro metabolic impairment. High levels of oxygen are a stimulant to the brain, and it overstimulates oxygen free radicals, which can over excite the brain and cause hyper-excitability that can more or less break down or exhaust the brain pathways in different ways that triggers the seizure. There’s a complex number of events that happen that can trigger a seizure. The etiology of most seizures are really largely unknown and it varied between people, but it kind of falls back into a breakdown of the energetic homeostasis of the brain. For reasons with don’t completely understand, the ketogenic sets the brain back into its normal neurological … I would say a neuropharmacological and energetic balance. That kind of what we study. That’s fascinating. I just wanted to throw in [inaudible 00:09:32] as well that I’m hearing two sides to the ketogenic diet. One side is … got these amazing properties that almost [inaudible 00:09:45] body in so many different areas and proven … I guess proven track record to be able to combat and ward off aging, oxidated stress, chronic disease. But then on the other side of the coin, it’s fad diet, and I say that in as much as people just probably lose weight on this thing. I’m just holding up a … I found this this morning as I was having a cup of tea at bed this morning. You see, my daughter’s trash mag, but it essentially is the Duchess of York now has adopted a keto diet. For the public, is this at all primarily for weight loss or should we dive in deeper and embrace it as a tool for longevity? I think it can be. I think it’s a very valuable tool for weight loss because ketones allow the brain to maintain kind of its normal metabolic balance and energetic balance, even in the face of low blood sugar. If we eat a high carbohydrate meal, our blood sugar spikes up, we release insulin. In many cases, that causes a post-prandial dip in blood glucose, and that can basically, our body’s thinking it’s going into famine, so we can craving, so we get hunger again. That’s essentially, if it’s not abolished on a ketogenic diet, it’s significantly attenuated, so you don’t get those intense cravings to eat, so it helps a person control their diet instead of their diet … I mean your appetite controlling them, you know? They feel much more in control and they don’t feel preoccupied with food. It impacts, in Brianna Stubbs, a PhD student now post-doctoral researcher, demonstrated … I think it just came out this week, that it also plays a big role on impacting a number of appetite regulation hormones like ghrelin, and through the ketones’ direct effect of ghrelin, and that’s independent of carbohydrate restrictions. It has a major appetite suppressing effect. There’s a good track record for the ketogenic diet or low carb for not only weight loss, but on the weight maintenance. Most people can lose weight, but they can’t keep it off. I would say of all the diets and all your tools in the toolbox, I think the ketogenic diet has a low carb … doesn’t necessarily need to be a strict to the ketogenic diet, but low carb, modified ketogenic diet, I like to say, is a very powerful tool for that. I study it from the angle of a metabolic-based approach to restore normal brain energy under conditions where there’s a pathology or an extreme environment. A ketogenic diet really shines under situations where your body’s at a deficit for one reason or another, could be a pathology, it could be an extreme environment. I’m just getting into research, I would say now, where we’re more interested in studying it in the normal person, and just doing what I would say longevity studies, and basically seeing … you know, if we feed ketones to an animal, if we give a ketogenic diet and different versions of the ketogenic diet and let the animal live its healthy, normal life span, or maybe we can prolong its life or its health span when we keep them in a state of ketosis. There’s emerging data to suggest that there are important longevity effects associated with elevated ketones. Yeah, got it. I just wanted to pop in there with all of that, and I thought you know what, I better mention this. For anyone that’s not familiar with the ketogenic diet and ketosis, and you are to do a quick pitch to someone who’d never heard of it before, how would you explain it? I would describe it in the context of fasting. When we go without food for 24, 48 hours, we burn up all our stored carbohydrate, all our sugar in the form of glycogen, and we release our body fat for energy, but our brains can’t use the fat that we have stored in our fat, so we convert that to small, water-soluble molecules that are water-soluble fat molecules that can go and restore and preserve brain energy metabolism in the face of fasting or starvation. We can mimic that effect by shifting the macro-nutrient ratios of the diet, that when we’re eating that diet and we were to check our blood independent of calorie restriction, it would look like we’re in a fasting state because our ketones would be elevated. It’s the elevation of those ketones as an alternative metabolic fuel for the brain that is really the clinical metabolic physiological definition of ketosis. If someone’s on a ketogenic diet, I would say you’re not on a ketogenic diet unless your ketones are elevated. That’s the clinical definition of the ketogenic diet, that you are making ketones. Got it … sorry Stu, while we’re on the ketones in the brain, have there been any direct studies in terms of relationship to stress? Because chronic stress is such a big issue these days in the Western culture. Has there been that relationship, in terms of perceived stress as well? Yeah, there is quite a bit of research going on on physiological metabolic stress. What we study as extreme environments, we subject animals to stressful environments, with and without ketones. Of all the things that we’ve studied … you know, oxygen toxicity seizures, which are very powerful [inaudible 00:15:56] form of stress, right? My wife is a behavioral neuroscientist, and did a study … and we tested a variety of different ketogenic agents. Using a test that the pharmaceutical companies use to look at anxiolytic effects of drugs — so, anxiety reducing effects of drugs. For example, the elevated plus maze, we found that producing nutritional ketosis acutely lowers anxiety behavior analogous to like a fear response in an animal. That has important implications for people. I mean generally, this world that we live in is producing stress in us that we probably didn’t have continuously … our ancestors probably didn’t have. We have overt anxiety-like behaviors as a result of the environment that we produce for ourselves, really. There’s good evidence that ketones can help attenuate some of the hyper-excitability and reduce some of the activity in the areas of the brain that produces this anxiety, and it does it through a number of different pathways, one could be the activation of glutamic acid decarboxylase, GAD. GAD is an enzyme that converts an excitatory neurotransmitter glutamate to a more brain-stabilizing inhibitory neuro-transmitter GABA. We have more transition of an excitatory, hyperactive neurotransmitter to GABA, so the GABA to glutamate ratio is elevated significantly when one is on a ketogenic diet. More recently, we’ve shown that the GABA to glutamate ratio is elevated simply by feeding ketones. That’s one of probably a number of different mechanisms that contribute to the anxiolytic effects of nutritional ketosis, which can be achieved by the diet or even supplementation. Interesting. As a member of the public wanting to adopt a ketogenic approach, how important is it for testing, initial testing? I’m thinking along the lines of getting our blood panels done to see what’s going on with our markers, and also the ability to measure the level of ketones whether we do it through, urine, blood. Where do we start? 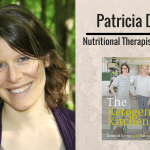 I think that’s absolutely essential, because to get the maximum benefits out of nutritional ketosis, it’s kind of good to get yourself to dive deep into it, so to say, and to really kind of embrace it and feed yourself the macronutrient ratio … it sounds complicated, but really not … that a ratio of a modified ketogenic diet would be about 60%–70% fat, sounds kind of high, 25% or so protein, give or take 5%, and 10% to at most 25% of calories from carbohydrates but mostly from fibers carbohydrates. Once you start that diet with that general macronutrient ratio, within about 48 … I would say 72 hours, you should start to register, most people, especially I they’re active, especially if they’re calories are also at a deficit … it doesn’t have to be but a calorie deficit gets you into ketosis a little bit faster … after about 48, 72 hours, you’ll start registering urine ketones, ketones in your urine. You want to probably use the cheap method to figure out if yes or no, you’re in ketosis. If yes, and you want a higher sort of granularity on the level of ketosis, you can use one of the blood meters that are on the market — Abbott Precision Extra, the Keto Mojo is another one — these can tell you … it’s good to get a handle on precisely how your blood ketone levels are changing in response to the food that you eat. Your ketones are inversely proportional to insulin, so as ketones go up, you know you’re keeping insulin suppressed, and if something knocks you out of ketosis, it’s likely it’s also spiking insulin. But you can also measure glucose, so the blood ketones meters conveniently also measure blood glucose. Those strips are cheap, they’re like maybe 25 cents or so, 50 cents per piece. I would recommend doing that, doing ketones and just simple … on average, you want to be about 25–50 grams of total carbohydrate per day or under that, and if you’re active, you’ll get into it. I know athletes that can eat 200 grams of carbs a day and still stay in ketosis day in and day out. They have tremendous output, I mean they’re exercising four to six hours a day, but just an example that you can’t always just assign someone macronutrient ratios or macronutrient prescription and expect an outcome because everybody’s different. Just a question that popped into my head there as well. Is it, in your opinion, easy to adopt a ketogenic diet that embraces a full range of nutrients across the board? Because I’m thinking, crikey, there’d be a lot of people out there just eat avocados and nuts all day long and not have a clue what to eat, and they’ll be missing out on valuable nutrients and vitamins and so forth. Yeah, that’s a really good point. There’s some people that just don’t like to eat meat or dairy or eggs. They are strong proponents to a diet that’s free of meat, dairy, eggs, fish, citing articles that they could potentially cause cancer and things like that. I don’t agree with that, but I think the food selection … there’s a lot of different books out there that have recipes, ketogenic diet recipes … I mean they’re exploding, because ketogenic diet is the most Googled nutrition program or diet on the market right now, so a lot of people are capitalizing on that and creating not only ketogenic diet recipe books and food lists. They’re actually making ketogenic diet pre-packed food will be available, and snacks and things like that. I personally believe that the thing I miss on a strict ketogenic diet, it’s why I do a modified version of it, and every day I don’t actually do it. I do low carb some days and do more ketogenic on other days, because I like to eat lots of vegetables. I feel like I’m missing out on a lot of phytonutrients, so I include one or sometimes two salads every day. Asparagus, broccoli, collard greens, cauliflower sometimes, and berries too. I get blueberries pretty much every day, or occasionally strawberries and raspberries, but blueberry is pretty much every day. I try to buy the wild variety too because they have about a third less sugar and some more fiber. I can eat upwards of 50 to a hundred grams of fibrous carbohydrates a day and stay in a mild state of ketosis. Not everybody can do that, but I can generally do that. I was going to … sorry, Guy. I feel like [inaudible 00:23:39]. While we’re on the topic of food … you’re a solid guy, and perception is that you go on a keto diet and you’re going to get shredded, you’re going to lose a whole heap of weight. I’ve tried … I’ve adopted this myself and I felt great, but I started to look emaciated in terms of I dropped a lot of weight. How do you maintain your size and possibly even increase size if that’s your goal, on this approach? It comes down to total calories, really. Getting the amount of calories that I need to gain weight and to eat and maintain my body weight, which right now I stay about a hundred kilograms, about 220, give or take five … If I do intermittent fasting, which I know a lot of people out there are doing, it’s very difficult. The amount of food that I have to eat between 4 or 5 P.M. and 10 or 11 before I go to bed generally disrupts my sleep. But I do do that … the last couple of weeks I’ve been traveling, but I was doing it about three or four times per week. Now I’m back home and I might do it once a week. I generally can’t maintain my weight or increase my weight if I’m doing intermittent fasting. Intermittent fasting is very easy when you do the ketogenic diet. It’s a lot easier, so I tend to feel better, but to maintain my strength and body weight, I have to divide my meals up into about two or three per day. If I’m gaining weight, three, and if I’m maintaining, about two meals per day. You need to really get the … if I’m hitting the gym more, I need to bump up my protein from at the minimum one gram per kilogram per day, so for me that’s a hundred grams per day. That’s needed to maintain it, but if I do get the opportunity to train more and for my weight to start creeping back up and gaining strength, I need to get about 150 grams, so that’s about 1.5 kilograms, 150 grams per day. I’ve tracked these parameters very tightly over the last 10 years, and I know my body, so I’m just telling you what works for me. But you might get kids or … typically, younger guys may not respond as well to the ketogenic diet because their carbohydrate tolerance is already really sky high. But if you take guys in their 50s and 60s, you have not really done low carb before or done ketogenic and they’re struggling with their weight and their insulin resistance, they respond immediately. They respond so fast to the ketogenic diet. Typically, these guys, once they’re metabolically fine tuned and they get low carb, their insulin sensitivity goes up. If they’re training hard, they can start gaining muscle, and the ketogenic diet, I think becomes anabolic. I mean their insulin and IGF1 levels may go down, but their insulin sensitivity goes up remarkably, just because they aren’t getting their metabolism in check. Well, I find that if I have a big event coming up or something the next day, and I have to be at my best. I will not eat. I’ll overeat a little bit the day before so my body is in a “fed” state, it has all the nutrition and nutrients that it needs, but I like to go into things in a, I guess you would call it fasted or semi-fasted state without eating breakfast or lunch throughout the day if I have something that’s very challenging cognitively or even physically. I just make sure that I kind of eat up to that and then back off. I feel more at ease and less stressed when I’m in a fasted state and I’m a little bit hungry. Because I follow a ketogenic diet, when I’m in a fasted state, I don’t really get that hungry. I don’t get starving. I feel best when I’m a little bit hungry, you know what I mean? I think, from an evolutionary perspective, if we were to go … with limited food availability and we didn’t catch our prey or find the food or whatever, and we became tired and less cognitively … we weren’t cognitively resilient in the face of starvation, we would likely perish as a species. I think it was the … the ones that had high metabolic resilience and actually performed better in a state when they were hungry, they were the ones that were able to go and forage for food, find food, and be athletically enough to track it down. I think, just kind of the way I think about it is that that’s probably why I feel best in that way. If someone says that when their hypoglycemic, they’re not worth anything. They can’t think, they can’t function, they’re tired, they just want to lay on the couch … well, I would say that’s not … I don’t think we’re wired for that. I think that’s a sign that they’re not metabolically tuned up, so to speak, and their metabolic flexibility is very limited. I think that’s one of the benefits of intermittent fasting, even without low carb, but I think it works better with low carb or the ketogenic diet. I think it just makes your body very sensitive. Even when you eat things, you can feel the effects it has on your body. I noticed that … you know, back when I was maybe younger and just gorging myself with food all the time and just pounding carbohydrates, I just felt like my body was like almost numb. You couldn’t even sense the response. My body is so sensitive to the food that I give it that I can actually detect how I feel and that has modified my food preferences, or the size of meals that I eat. For sure. Do you think you’ve got to the point as well that you can tell when you’re in ketosis or not? I’ve got a question on the approach then for ketosis, and this comes from good friend of mine from a surf club, our local surf club, who’s very, very excited when I told him that we’re going to be speaking to you. He’s intrigued about nutritional ketosis and wants to know if you can achieve a better, a healthier state of ketosis that can be achieved with supplemental ketones. He’s essentially saying are we better off fasting or carb-restricting and eating a ketogenic diet, if we had the discipline to do so, or can we expect to enjoy similar health benefits by taking supplemental ketones? That’s a good question. That’s a question I get a lot, actually. We know that the ketogenic diet produces real benefits metabolically, physiologically. I think some of those benefits, but not all, will be experienced with exogenous ketones, but clearly, you are not producing the same metabolic, physiological state you would be if you are restricting carbohydrates and feeding fat. But we do know … and this is research that emerged after I started studying the ketogenic diet … that ketones have an effect on gene transcription. They activate genes associated with cellular resistance and longevity pathways, even. Our collaborators at Yale demonstrated that the ketone beta-hydroxybutyrate suppressed a particular part of the immune system, that when that immune system is activated, it contributes to age-related chronic diseases, auto-immune disorders, brain injury, even some forms of cancer. It’s the NLRP3 inflammasome, and it’s comprised of a number of protein subunits, peptide sub-units, that when it’s primed and it’s self-assembles, it activates and releases and causes the generation of many inflammatory cytokines. The ketone beta-hydroxybutyrate essentially prevents that from being primed and being self-assembled and activated. In a way, if we stay in a state of ketosis simply by elevating beta-hydroxybutyrate, it’s preventing inactivation of inflammatory pathway that’s associated with more systemic, that chronic systemic inflammation? A lot of people self-administer non-steroidal anti-inflammatory drugs continuously, like every day. I’ve had people say when they got on a ketogenic diet or they started intermittent fasting, and some people have been using ketone supplements, they’ve been able to completely get off of these NSAID drugs — ibuprofen and naproxen sodium and things like that — completely get off of them, and their inflammatory markers like C-reactive protein went down considerably. My C-reactive protein is like 0.1, and even when I was subjected and lived in an extreme environment, underwater, as part of a mission for NASA, which produces inflammation, my C-reactive protein elevated but it stayed way lower than expected, because I believe, because i stayed in a state of ketosis. That’s probably … one could say that the etiology of many diseases, neurological diseases contributing in part to neuro-inflammation … and inflammation is a hallmark characteristic of cancer and an initiator of cancer. Inflammation damages cells and it damages the nuclear DNA in a way that can kick on oncogenes and transform a normal cell into a cancer cell. Suppressing inflammation suppresses the damage to cells that could otherwise [inaudible 00:34:30] carcinogenesis. [inaudible 00:34:33] two parties as well, the first one being endurance athletes that are putting their bodies in extreme chronic stress as well, long-term. If you were an endurance athlete, because we’ve been looking at the work of Dr. Stephen Phinney and Jeff Volek as well over the years which is pretty amazing … If you were an endurance athlete, would you, for performance and longevity, would you be in ketosis? I would. I thought about this. I hate running and I hate … I used to ride mountain bikes when I was younger and I still enjoy that, but I like to … you know, when there is big hills or more like sprinting up … the approach that I would take would be to train low carb and train keto and low carb, and during race day, I would use carbohydrates and be very selective of the carbohydrates I use very sparingly. I would always keep the body a little bit hungry for carbohydrates, but in cases where I was doing the last … the hill climb on the bike race, or running or rowing or whatever it be, I would primarily keep my body fat adapted to be fueled off fat and ketones and use carbohydrates as a supplement. Glucose, I would have to say sugar is actually a pretty good performance enhancing supplement, but we have to respect it and use it sparingly, especially if you want to be a fat-adapted athlete. But for the most part, I would train low carb, train in a keto-adapted state, and only periodically use small amounts of carbohydrates when it was needed. That’s the approach I would do. I would try to use all fuels, right? We don’t want to exclude one fuel or another. Try to adapt our body to be metabolically flexible, and in a point where we are in … need extreme performance or energetic requirements, try to rely all fats and ketones but titrate in other types of fuels whether it be Alpha-L-Polylactate, which some athletes use, or beta-hydroxybutyrate salts, or glucose, different forms of slow releasing polymers of carbohydrates that are kind of now used by athletes that don’t necessarily cause an insulin response or a spike in blood glucose could be [inaudible 00:37:07]. Creatine, creatine monohydrate too is something underutilized, I think, even in long duration exercise. While we’re on the topic of exercise and recovery, I’d like just to delve into sleep a little bit. Obviously sleep is a huge pillar in recovery. How does your take on nutrition come into providing perhaps yourself personally, the best sleep that you can have? Is it fat carbohydrate timing, fasting, what do you do? Sleep was part of the study that we did recently, under sea study, the NASA Nemo Mission actually. I don’t have it now because it’s charging, but I wore the aura ring. I don’t sell or market for them or whatever, but it’s a pretty clever device, and it measures sleep timing and sleep architecture. It tells you your deep, your REM, your light sleep, and it allows me over the last year of using it to determine the factors that can ensure that I get … that decrease my sleep latency, so we want to fall asleep fast, and we want to get a max amount of deep sleep and REM sleep and ensure that you get … I try to get seven hours of sleep every night when I can, a little bit more if I’m sleep-deprived, in a sleep-deprived state. The ketogenic diet seems to allow me to consistently function almost optimally of six and a half to even six hours of sleep. If I get less than that, then I can definitely feel it. I’m on less than that now, so I had two nights of five hours sleep back to back, and I’m doing okay. [inaudible 00:38:56] state about 18 hours fasted now, and I feel fine. But I’ve also noticed that certain things … if I do intermittent fasting, for example, and I eat too much later in the day, then it disrupts my deep sleep. I’d get a limited amount of deep sleep. I do tend to eat at night more often than not, but I try to get the bulk of my calories in during that first phase of the six-hour eating period. I noticed that sometimes when I space my meals out a little bit, I sleep a little bit better. Also, I noticed that if I have one glass of wine, I’m okay. But consistently I’ve noticed and I validated it many times over, alcohol, two glasses will disrupt my deep sleep. I’ll fall asleep fast, but when I go back and look at the data, I consistently will get one hour of deep sleep instead of two or three hours of deep sleep, which I can get on a pretty routine basis. That just triggered another question as well, regarding jet lag and long flights. Have you looked at fasting and ketosis in terms of recovery and jet lag? Yeah, I do. That’s what I do. My wife and I, we travel. It seems like I’m traveling non-stop. I was in Portland a weekend before last, and San Francisco last weekend, but I live in Tampa so it’s like three-hour difference, but we also travel globally a lot. When I do, I tend to rely on the sun to set my circadian rhythm, so we did our … when we went to Philippines, I kind of landed there, and I tend to not sleep on a plane, so when I travel, I do … I eat up the days leading up to extended travel, and I do like to fast until I get to my location, and I try to reset my circadian to prevent jet lag at that destination and try to just wake up and experience the sun early in the morning and just get outside in the environment, in the water, to reset circadian, and I notice very little, if any, jet lag when I do that, instead of trying to sleep during the day and things like that. I generally don’t try to do that. I just try to kind of grind it out and just wait til the next morning, and just get up, get as much bright sun as possible, and especially if I’m going to be there a while, I just try to adapt. I experience very little if any jet lag. I think keeping your blood sugar, being in a state of semi-fasted state just allows you to deal with stress a little bit better, I think, and with jet lag. We were just there, actually. Yeah. Costa Rica’s great. I would recommend lots of sun, should be a lot of sun in Costa Rica so I would recommend yeah, getting there and just make sure you sink your body to the light and dark cycles and [crosstalk 00:42:16] be great. Yeah, fantastic. I’ve got another question here, Stu. Sorry, mate. Thinking back to our listeners as well just to get some clarity for them while we’re on this topic, because you’ve got the elite athlete that’s looking for an edge in performance and recovery and so forth, and then you touched on it earlier about using ketosis for people who’ve maybe health is in crisis, that can be therapeutic and advantageous as well. What about the people in the middle, that kind of just might train twice a week and go to work and … should they be working at ketosis? I definitely think it has … nutritional ketosis, intermittent fasting, and exogenous ketones all have something to offer, and they don’t have to be mutually exclusive, I like to use variations of that, even ketogenic fats like medium chain triglyceride or something like that. Maybe I’m that middle guy. I’m not really an athlete, I don’t compete or have aspirations to, and I kind of don’t get into the gym every day. I try to some activity every day, if I don’t get to the gym, I walk my dogs or do something … and I feel like I get legitimate benefits from it. Most people out there probably listening to this may have a job with high demands. Being in academia, I kind of consider myself in a relatively higher than normal stress occupation, I think, just because of long work hours. Like today is a holiday, nobody else is really here, the university [inaudible 00:43:51], and I’ll be here tomorrow on the weekend too. I work really long hours often, and it involves a lot of cognitive attention, resilience, however you want to call it. I need to stay focused for long periods of time, and the only way that I find I can do that day in and day out … I mean you can consume stimulants and amount of caffeine, right, but that just makes me jittery and probably doesn’t allow me to focus. Being in a state of ketosis allows me to quiet my mind in a way and able to focus on a task for extended periods of time. Almost analogous to Jeff Vole, it talks about preventing you from bonking when you’re doing super hot ultra marathons. It’s kind of the same way when I’m in the office, and I have a stretch of 12 hours where I have to crank out a grant or do a bunch of paperwork. I feel that if my glucose was bouncing up and down throughout the day and I’m feeding myself snacks and sugars and things like that, I wouldn’t have the attention span and the ability to focus and complete the task. I think a lot of people out there listening to this, maybe putting myself in their shoes, maybe I might be in a similar situation where they’re in the office and a lot of demands are put on them. I think they’re better able to achieve it and be in a better state of flow. That’s how I describe it when I do intermittent fasting. I was just thinking about it the other day, that I feel like I’m in a state of flow when I’m in that semi-fasted state and I’m task-loaded. If I’m task-loaded and I’ve eaten just a crappy diet or whatever that puts a lot of psychological, mental stress on me, I can deal with it a lot better if I’m in kind of a semi-fasted state and I feel more capable of handling that. It’s one less stress. You know, we’ve got enough stress in our lives anyway, and it’s one element that’s taken care of, that doesn’t contribute. What are your thoughts around stress itself? How do you handle stress outside of ketosis? Do you meditate as well or anything like that? I do … there’s a number of things that I do. Every day, I have I guess you would call creative downtime with my wife. Even the days that I intermittent fast, she doesn’t like when I intermittent fast because we’re not eating breakfast together, but I’ll have my coffee and I’ll sip it slow, and we’ll spend time together in the morning and in the evening, and that’s kind of like my reset. Mornings are quick sometimes. It can range from 15 minutes to maybe 45, but in the evenings, what I do is after 7 or 8 P.M., trying to get to 7 P.M., no social media, no emails, turn the lights down, basically I just go off and turn all the lights down as low as possible, and then we just do our quiet time. A lot of times we’ll watch a movie or half of a movie, read a book together, and we take the dogs for a walk almost every night. It’s usually just getting dawn or about, depending on the time of year. I do that, and then we have our little ritual with dinner that we do our little prayer meditation thing right before we have dinner, and it’s more just reflecting about what we’re grateful for. She has her thing, I have my thing, so we don’t pray or meditate or say words that … we’d just go into our zone, and it’s super quiet, and we just get centered. It’s more like I have my routine, she has her routine, but we do it together, but we’re doing it separately, I guess. We do that every day, and I think it’s really important. I do, I’ve been experimenting with things like Buteyko Breathing. Next, in a few months, I’m going to be doing some research with Wim Hof and trying to understand his method and actually studying it from a scientific perspective and seeing what things I can extract out of that method. I like to put a lot of different methods together to come up with something that can be feasible and actionable for people to implement in their everyday life. I’m experimenting with a lot of different things. Yeah, and I thought like I’d come out of some military boot camp by the end of it. But the physiological changes I could feel were meant just within that five days. I didn’t do any testing except a urine test, with the alkalinity on the body, but from a personal perspecitive, I was like, wow, that was something else. We’ll be doing some hikes together and … it’s all something … you know, maybe I shouldn’t even be talking about. I don’t know if it’s public knowledge yet, but I think it’s actually something he wants to promote. I just want to tag along to do the science and to try to understand from a scientific perspective what’s going on here using various … everything from blood glucose to ketones to maybe some wearables that can capture some data on what’s going on with it. Well, I hope you realize, Dom, that he will have you hiking in just your boxer shorts. You know that, don’t you? That’s what he does, that’s what he does. Yeah, he is. Have you met him before, Dom? No, we’ve chatted. I’ve been talking with his daughter, I guess. We’ve had some calls and lots of emails and I’ve been reading things and we have mutual friends but we’ve never met face to face yet, so I’m excited to meet him. Oh great. He’s a great human being. He’s crazy, but he’s great. He’s a good guy to be around. That’s fantastic. I look forward to it, I look forward to hearing all about that, that’d be amazing. Dom, I just noticed the time, mate, and to wrap up the show, we ask a couple of questions at the end, every week. The first one is what are your non-negotiables to be the best version of yourself each day? Non-negotiables, so things that need to be done every day? I would say every day, I need to have creative downtime, specifically for me, with my wife or significant there. I think relationships above all need to be prioritized, even above myself. So it’s relationships number one and for me, my creative downtime is to do that, to establish it, that relationship. Fantastic. The last question is what’s the best piece of advice you’ve ever been given? Best … wow, I’ve been given a lot of really good pieces of advice. Man, I don’t know, it’s kind of like a stretch because everything’s kind of … the best piece of advice … I think really just living with gratitude. I definitely have … I’m not where I’m at without the help of others, so I almost like I feel like I’m stealing some of the spotlight from people who should otherwise be getting it. For example, my students [inaudible 00:51:59] that are in the trenches day in and day out doing the work. I’ve had various mentors throughout the past and at the top three best ones that I really admire and appreciate, they all gave me the same kind of advice, and that’s what I see similar in people that have an impact on me and that I admire very well, is that they are very grateful. There’s a level of gratitude. They tell me this information and show it in different ways. I think that’s the number one thing that I always … When things get really hectic like sometimes I’m like, “On a holiday and I’m in the lab, why do I have to be in the lab?” It’s like, “Wait, I love what I do, this is like my vacation, this is what I love to do,” so I kind of reset and say, “Hey, I’m very grateful to have the opportunity to do the kind of research that I do and to have the amazing people in my lab that actually are super smart, talented, and enthusiastic people in the lab.” Gratitude, I think. Yeah, fantastic. 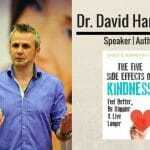 We’re very grateful for you coming on and sharing your wisdom and putting yourself out there on podcast [inaudible 00:53:14] a huge impact for sure, and making people think very differently, including ourselves, about what we put in our mouths daily and how we live our lives. Much appreciated. For everyone listening to this, Dom, where can we send them if they want to find out a bit more information about yourself? Yeah. My website is ketonutrition, all one word, dot org, and on that website, I have a lot of resources, a lot of links on there, from clinical trials to books, to nutrition consultants, to products that I personally use and tested and validated in the lab here or on myself. A lot of information there that could usually answer about 90% of … a lot of people email me. I wish I had … actually, doing email is much more interesting than all the paperwork I have to [inaudible 00:54:08] often in the office. I often get caught responding to too many emails, but sadly I can only get to about 10% of them, but a lot of the information, things that people ask me can either be found in those books or on the website in some shape or form. Ketonutrition.org. We’ll link to it in the show notes as well for everyone that’s listening to this. Fantastic. Dominic, thank you so much for coming on the show and being our guest. That was simply awesome, I really appreciate it. Thank you for having me, Guy, and appreciate … and I would love to be on again if you guys ever need me to talk more. I have no doubt. This conversation could have gone in so many directions, it was awesome. Thank you, gentlemen. 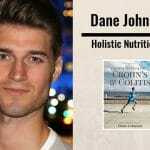 Dane Johnson – Is Crohn’s & Colitis Ruining Your Life?